Whether you are a bargain hunter, collector, connoisseur or just curious there’s something for everyone! Antiques, Collectables, Jewellery, Art, Vintage, Furniture, Curios and Decorative items. due to popular demand from stallholders and customers we have DOUBLED THE SIZE to accommodate up to 100 stalls by moving into the Main Exhibition Hall at Springfields Event Centre. VISITORS to the fair since this expansion have also DOUBLED. We are looking for dealers of all types of trading ie. Traditional Antique Furniture, Silver, Ceramics, Vintage Ware & Clothing, Chabby Chic, Telephone & Radio, 20th Century Designs, Quality interesting collectables – anything to make an exciting day out for the public in this busy part of Lincolnshire – but please No Fake or Reproduction goods intended to deceive. 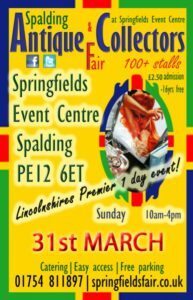 Lincolnshire’s Premier 1 Day Event !